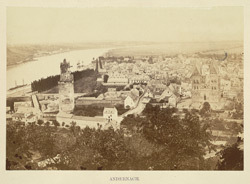 View of Andernach by British travelling photographer and publisher of continental views Francis Frith. Frith spent 6 weeks following the course of the Rhine and stopping at tourist sites in Switzerland, Austria and Germany. His photographs illustrate scenes from Henry Wadsworth Longfellow's novel Hyperion. In the text accompanying this view, Longfellow's fictional hero Paul Flemming describes "threading his way alone" noting items of "romantic interest," such as the city wall and "that round old tower built by the Archbishop Frederick of Cologne in the twelfth century," which are visible in Frith's photograph.